"If you're like me, I can't stand the last minute rush and expectations in making the turkey gravy. You have one shot and it better be good! Well, this takes out all the stress of that last minute dash. Can be frozen or refrigerated for five days. This is honestly the best turkey gravy I've ever had. You dirty a few pots and pans, but it sure beats the last minute rush Thanksgiving Day. Let me know what you think. Bon appetite!" Place the turkey wings, onions, celery, carrots, and garlic into a roasting pan, and roast until the turkey wings turn a deep golden brown color, about 1 hour and 15 minutes. Transfer the cooked wings and vegetables to a large pot. Place the roasting pan over 2 stove burners on medium-high heat, then pour the white wine into the roasting pan. Scrape off and dissolve any browned flavor bits from the bottom of the pan into the white wine; heat and scrape the roasting pan until the drippings and wine have reduced to about 1/2 cup. Pour the wine mixture into the saucepan with the turkey wings. Pour chicken broth and water into the pot, and season with thyme. Push the turkey wings down into the liquid; bring the mixture to a boil, reduce heat to low, and simmer for 45 minutes. Skim off any foam that collects on top. Pour the broth mixture through a colander into a large bowl; pick meat from the wings, if desired, to add to gravy, or discard the spent wings and vegetables. Allow the gravy base to stand for several minutes for the fat to collect into a layer on top, and skim as much fat as possible. Transfer the skimmed fat into a saucepan. There should be at least 1/2 cup of turkey fat; add butter to make this amount if necessary. Whisk the flour into the turkey fat over medium heat until the flour mixture becomes smooth and golden brown. Gradually whisk in the broth until the gravy comes to a boil and thickens. Season to taste with salt and pepper. 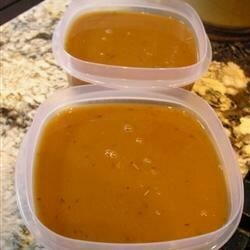 Allow the gravy to cool, then refrigerate or freeze. Reheat almost to boiling to serve. Save your sanity on Thanksgiving Day by making rich turkey gravy in advance! To make this recipe gluten-free, use homemade chicken stock or water--or be sure your chicken broth is gluten-free. The nutrition data for this recipe includes the full amount of the stock ingredients. The actual amount of the ingredients consumed will vary. For richer flavor, add turkey pan drippings to the gravy at serving time. The best gravy ever. I used turkey thighs and turkey broth instead of chicken, and added garlic to the roasting pan, but did not make any other changes.